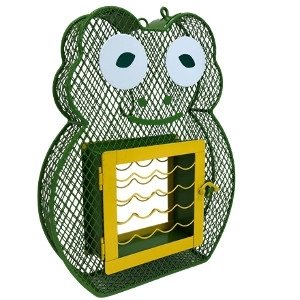 The Suet 'n Seed Frog Bird Feeder is uniquely designed to hold sunflower seed, shelled peanuts, and up to 2 suet cakes. The all-over mesh construction is ideal for clinging birds such as finches, chickadees, nuthatches, woodpeckers, and more. A door on top of the feeder opens for filling seed or peanuts. 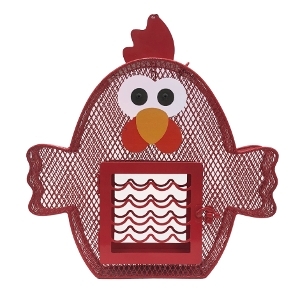 The Chicken Seed & Suet Combo Feeder holds two suet cakes and sunflower seeds or shelled peanuts. Woodpeckers, nuthatches, chickadees, titmouse, and cardinals will love it. 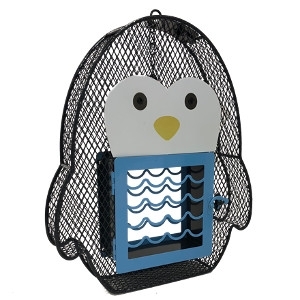 The Suet 'n Seed Penguin Bird Feeder is uniquely designed to hold sunflower seed, shelled peanuts, and up to 2 suet cakes. The all-over mesh construction is ideal for clinging birds such as finches, chickadees, nuthatches, woodpeckers, and more. A door on top of the feeder opens for filling seed or peanuts. 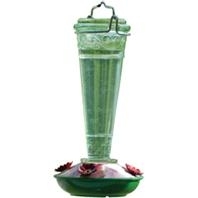 This delicate, decorative glass feeder features a glass top and green base that attracts a variety of hummingbirds. It has a decorative, twist-off base with four no-drip colored flowers. Easy to clean and easy to fill! 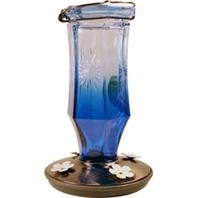 The Sapphire Starburst™ Hummingbird feeder features a beautiful, blue glass vintage style bottle. It is embossed with star accents and includes an easy to fill & easy to clean wide mouth bottle. It has 4 feeding ports. The Isabella™ Hummingbird feeder holds 10 fluid oz. Inspired by antique stamped tin ceiling tiles from Victorian era, this elegant feeder features a highly detailed metal basin top with five feeding ports and built in perches. Glass bottle and built-in ant moat. Wide mouth bottle for easy filling and comes apart for easy cleaning. Decorative hanger included. 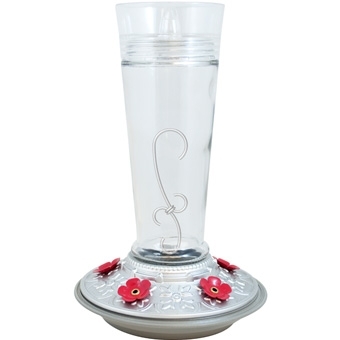 The Topaz® hummingbird feeder holds 13 ounces of nectar. Inspired by a floral motif, this classic feeder features four feeding ports, built in perches, and glass bottle with built-in ant moat. The wide mouth bottle, and flat bottom which sits easily on the counter, makes for easy filling. The feeder comes apart for easy cleaning. Includes a decorative hanger. 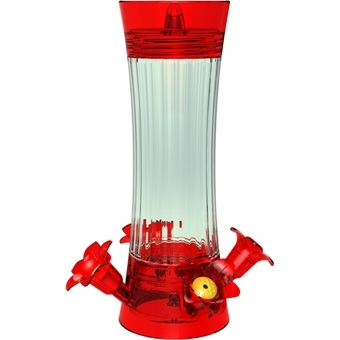 The Ruby Prism Hummingbird Feeder from Stokes Select is an elegant and innovative design. The bright red color will attract many hummingbirds. This hummingbird feeder is designed to be sturdy and long-lasting. The nectar bottle is constructed of polycarbonate plastic and has a wide-mouth for easy filling and cleaning. Stainless steel base and flowers are chosen to be long-lasting and weather-resistant. The large capacity bottle holds 24 oz. of nectar to energize your beautiful hummingbirds. If you have fewer hummingbirds, you may use less nectar per filling. The life-like red flowers are a sure attractant for hummingbirds. This feeder easily disassembles for thorough cleaning and is dishwasher safe. Feeder also includes a leak resistant seal. The feeder base seals snugly to avoid messy dripping. 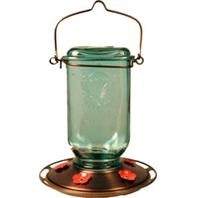 This beautiful square mason jar has a rustic metal finish to capture the vintage look. It features 5, integrated metal flower ports. The wide mouth design makes it easy to fill and easy to clean! The base disassembles for simple cleaning which helps reduce or eliminate spillage. This 3-In-1 Hummingbird Feeder is easy to fill and easy to clean! 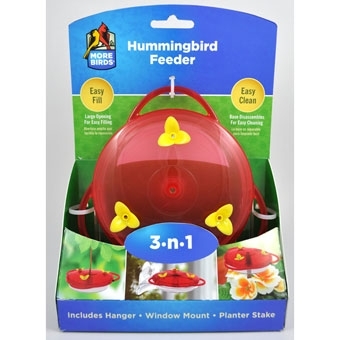 It can be used 3 different ways-can be used as a window feeder, staked feeder, or can even just be hung. Holds 6 fluid ounces of nectar and features 3 perches.